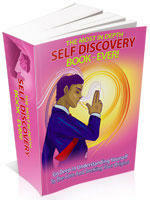 Discover your strengths and unleash your full potential by tapping into these secrets of self discovery! Tired of your circumstances? Finally... you can discover your inner being with these self discovery tools and change your life and live your destiny forever! We all have powers inside of us waiting to be unleashed. The problem is we don't know for sure what we have inside of us. If I asked you to tell me about 5 of your strengths, do you think you could give me a straight answer? I highly douby so. But fret not, there are certain tools which will be able to help you discover your inner traits which support your success in life. 99% of people in the world aren't living to their true potential because they fail to tap into their inner powers! (or because they don't know what they are). Ask yourself, have you ever faced any of these problems in your businesses? -Feeling frustrated and unfulfilled at work. -Feel like you are fighting an uphill trying to suceeed in life. -Living life aimlessly and having no purpose in life. Well, you are not alone. I’ve once walked down this lost path and I told myself that I would do whatever it takes to help others succeed in finding their true path. Today, I’ve made massive progress and I would like to share these secrets with you.